You can depend on us for a high degree of dignity and care for you and/or your loved one. AllCare Living Services, Inc. provides superior private duty care for those in need of special services whether it is in the comfort and privacy of their own home, in a nursing facility or during a hospital stay. The highly qualified, caring and compassionate staff at AllCare Living Services, Inc. is here to guide and assist you with your care plan. We recognize that making many decisions during this time can be confusing and overwhelming. We listen to your needs and requirements and customize a plan that fits you. Our services are designed to keep you happy, healthy and well cared for while offering your family peace of mind. 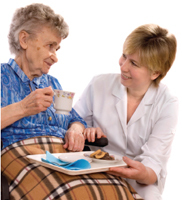 AllCare Living Services, Inc. can provide care for a few hours a day or 24 hours a day, 7 days a week. Our certified caregivers are trained to assist with a full rage of personal care and support services. Regular supervisory visits to you from our nurse and field supervisor to ensure that we are filling your needs and meeting your expectations. We communicate with family, physician and case manager on any changes or new requests. The care you need is quick, affordable and available 24 hours a day, 7 days a week. All of our caregivers have extensive geriatric home health care experience and are supervised around the clock by nurses. We have meticulously selected our team to ensure that you receive the most qualified, competent and compassionate care in the industry. We will answer your questions and help you make informed decisions. Call us anytime. We can begin a care plan within 24 hours. Proudly serving Berkeley, Charleston, & Dorchester Counties. For over twenty years, Kelly Williams, Owner & Director of AllCare Living Services, Inc. has been dedicated to helping our community care for their loved ones in the privacy and security of their own home. AllCare was built on Kelly's personal belief in traditional family values and treating every individual with dignity and respect. She is personally involved in all assessments. This allows her to relate to and understand the wants and needs of the clients and their families. She can ensure an appropriate skill level of care and compatibility between patients and caregivers.